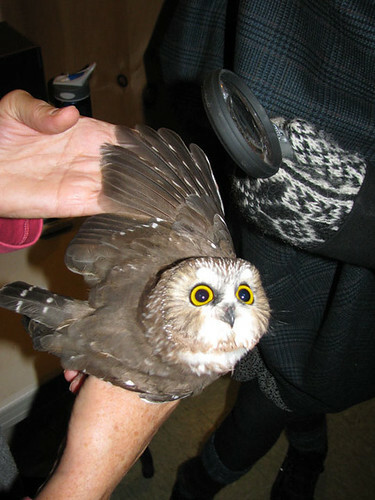 It was a saw-whet owl with a (photoshopped) hat that hit the internet a couple weeks ago, wasn't it? Yeah, the owl in the Jayne hat? 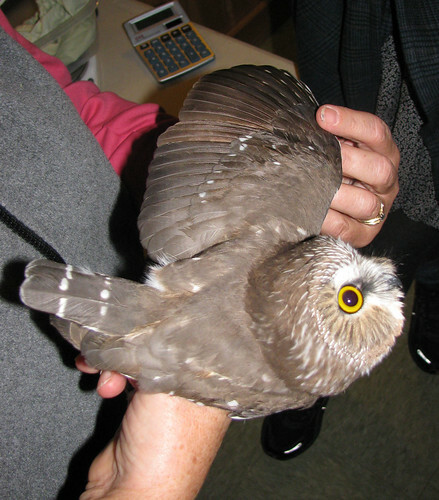 Probably originally a pic from another saw-whet banding station. That is so cool! Good for you! They are really adorable. Does anything else ever got caught in the mist nets when you use them at night? I've been meaning to comment on your CA trip photos but have been too busy. I'll try to get them sometime! Yeah -- as I said, last night, we also caught a flying squirrel (which are bad because they'll chew through the nets, necessitating repair). 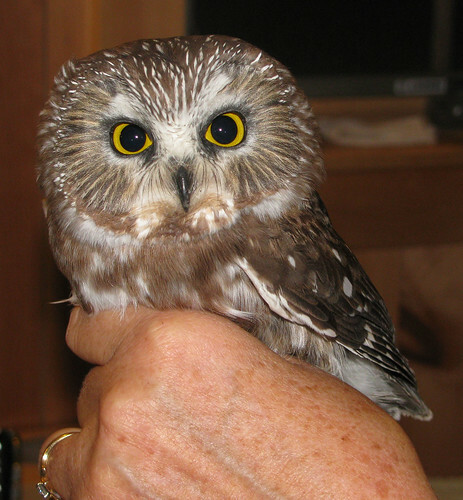 Earlier this season, our location also netted a screech owl. There are a couple of occasions in the past where a barred owl will get into the net (which starts to get serious because the banders aren't really equipped to handle something with talons that serious). And a few times, deer have gotten into the nets, and ruined them. 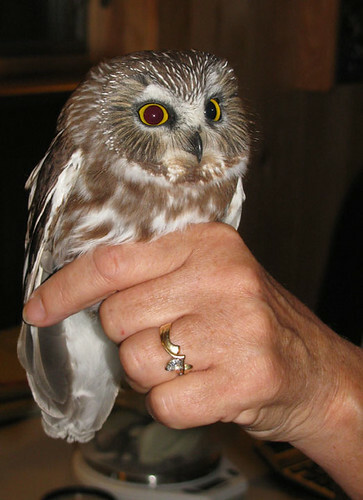 A major danger that we have to watch out for is that some predators will figure out that the smaller owls are trapped in the nets. Last night we had to scare away a raccoon, and the banders told me that in the past they've seen raccoons just hanging out in the trees around the nets, watching. 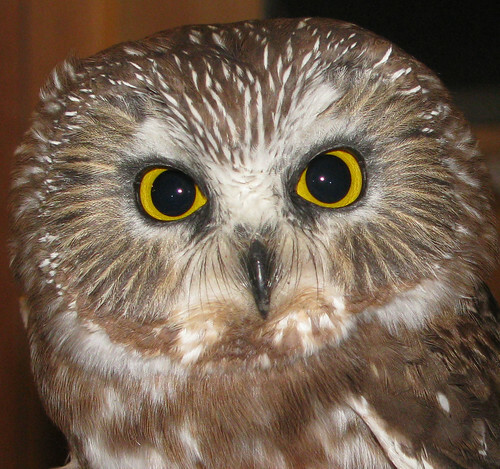 And if you hear a barred owl, or a great horned, close by, you have a make a choice between closing down the nets, or hanging out out there in hopes of discouraging the predators. Durrr on my part about the flying squirrel- that's what happens when I read LJ fast between classes. -_- I bet the little guy was cute though! omg, I met a screech owl over the weekend (I was volunteering at a Girl Scout event and the Raptor Conservancy brought some birds) and that was the first time I saw those little beak whiskers. SO CUTE. Also I'm surprised (and impressed) to see the bander is holding the owl without gloves. Are these guys not so pointy? They're pointy like little needles. But I think the outlook here is that getting taloned isn't as bad as it can be with the bigger species... usually. 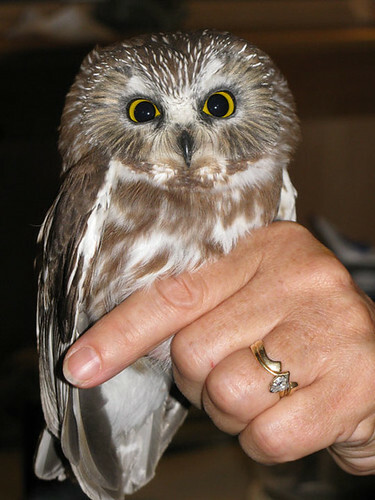 And the owls themselves are so tiny that gloves would interfere with holding them. So there's still a risk involved in the bander putting their hand into the cloth bag to get the owl out for all the measuring. They do get pricked during that process. But that's largely about it. Back in my post with the pics from the demo last year, I had a pic of the bander with all four talons of one of the owl's feet poking into her little finger. She said it hurt, but not THAT bad. Lovely description as well. ::::massive hugs:::: I'm so happy this is working out! Ah, but there's more to it than that and you show / frame them beautifully. I canNOT resist that face. Goddamn. Wow, what a terrific thing to do. And look how wee he is and compact and big-eyed and sitting right there! I've heard Saw-whets in the woods near here, but not seen one. Very, very cool. They can apparently be very hard to spot in the wild because they like really dense places to perch. But look for them relatively low to the ground, on evergreen-type things. OMG! Great pictures! I'm so glad you get to work with this project. Thanks! Yeah, I'm enjoying it a lot. :) I'm glad they still had space for volunteers when I wrote in, as it's clearly becoming a really popular thing to do here.